Don’t care if you’re couthie or not…if you shoogle it, you’ll end up draekit. Ya (bleedin’) glaekit numptie. I have a friend who definitely believes in the Pareto principle and quotes it at every opportunity. The basic idea is that about 80% of the result comes from 20% of the work (and the converse: you do 80% of the work and get only 20% of the benefit). Business people talk about this concept often. It’s regularly used to talk about where you’re putting your effort and how you can better optimise your success. There’s a lot I could talk about regarding this, but I’d like to focus on the way people work together. How groups function, and what sorts of people make up successful ones. But first, why? Where did this topic come from? I got to thinking about the German idiom ‘Abwarten und Tee trinken‘, which has always made me smile. I like it partly because it includes something I love (tea drinking), but also because it’s a decent option of what to do when you’re just not sure about the next step. Literally it means ‘wait and drink tea‘. Yet as with most idioms, the literal definition is only part of the story. Wait and drink tea is used specifically when adding pressure to negotiations won’t help. When the best thing to do is to do nothing at all. So, you have to wait…and while waiting, why not brew some tea? It’ll at least make the wait a bit more pleasant. One of the translations I saw while searching for examples of ‘Abwarten und Tee trinken‘ was wait and wonder. If you know anything about me, you know I love that sort of thing. Sitting and pondering things. At length. Sometimes to my detriment. Then I went a bit farther down the search list and what did I find? An article from 2005 in Der Spiegel called Warum wir abwarten und Tee trinken (Why we wait and drink tea). And here’s where we get to the workings of a group. The article talks about a study done by evolutionary psychologist Robert Kurzban in which he divides groups into three types of people. There are the helpers (active, selfless volunteers) and the freeloaders (those that don’t do anything). If you’ve tried to plan or accomplish anything in a group, you know about those. But then he mentions a third group, and those are the ones who wait. They’ve seen Pareto principle in action, and they’ve already come to the conclusion that a very small number of the group is actually going to do anything. Having seen the freeloaders get by with little if any work on earlier projects, the ones who wait take a bit of a fatalistic stance and then they watch carefully what happens next. It’s what they do. I had a look at the website of the Proceedings of the National Academy of Sciences, where the original study was published. Alas, I found a lot of other materials there about the work of Robert Kurzban, but not this specific study. Here I am translating a German article that’s citing the original…I wonder how close my reading of it is to the source material. According to the people studied, 17% of people belong to the helpers and a full 20% to the freeloaders. The largest group by far is the ones who wait whose numbers come in at a whopping 63%. The claim that’s made is that one can predict how reliable a group is based upon the numbers in each subgroup. The ratio of the useful to useless is important, but what’s also crucial is how many people are willing to work if they see that their effort will have any appreciable meaning. How does one accomplish that? The answer offered is that everyone be informed about each individual contribution. That there’s a sort of positive accountability, in which the ones who actually did the work are praised accordingly. Once the ones who wait see that there exists such accountability, they’ll be much more willing to take part and contribute. Until then, they’ll be happily drinking their tea. 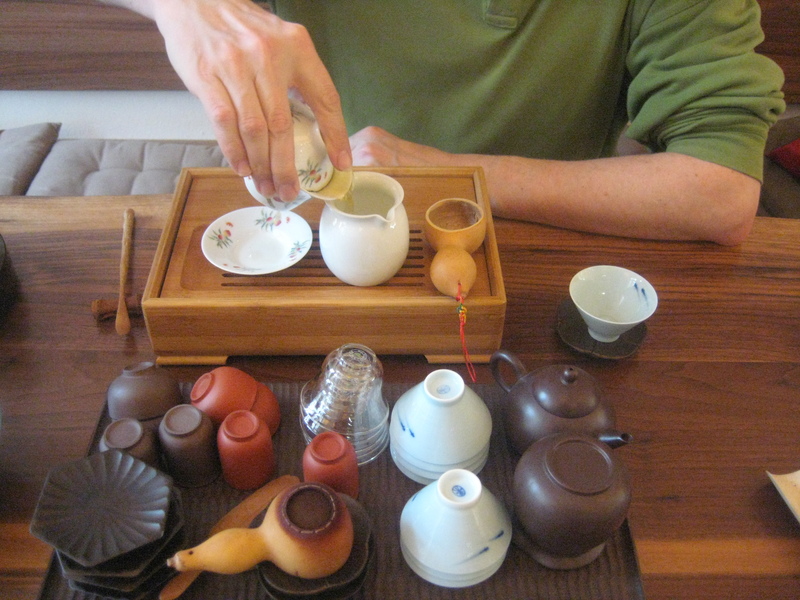 Shameless plug: here’s my teablog post on the same topic Abwarten un Tee trinken. That’s an exciting subgroup to be in. I’d suggest continuing with that tea drinking then. Ugh, new laptop is going to have a learning curve, I think. I am not so good at writing with this at all. I like the wondering. I do a lot of wondering. Wondering is one of my favorite things. I get my wondering done while I’m doing all the work myself so I can just go home. I’m ok with that. Wondering is where the best thunking comes from. Oh, you’re just rubbing in the dreams now, I see how it is. I actually had one last night but promptly forgot it within seconds of waking up. Unhelpful. Visit Macbeth Knowles Consulting to see what language and social media services I offer. Thirteen years old…Still fit as fiddles…are we Italian now? Pay no attention to the man behind the curtain. Just adjust your idea of "fine". A couple of lovers and travelers embarking on the world, sharing their adventures and travel insights. Brightening up your day with a smile or even a laugh!